I've become a huge fan of shredded carrot salads lately - first a Moroccan carrot salad and more recently this lemony cumin version. They're easy to make with a food processor and they're a nice change of pace from lettuce-based salads. You can also easily adjust the flavors to go with a wide range of main dishes. In this case, I was serving the salad with pasta, so I went for a couple of flavors that were also in the pasta dish - fresh parsley and freshly squeezed lemon juice. After tasting the salad, I decided some toasted cumin seeds would be a great addition, and they were - they added a lovely subtle smoky flavor. 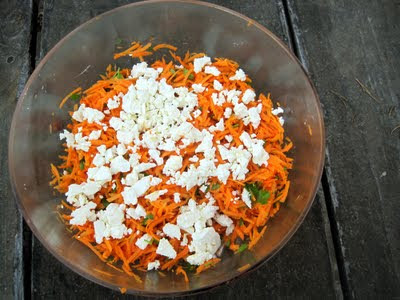 The feta on top added great tang and a bit of richness to the salad. 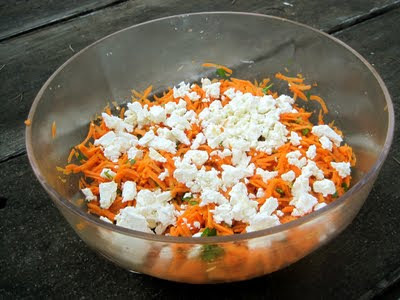 Toss together the carrots and a good handful of parsley, and season with salt and pepper. Toss in some cumin seeds. Drizzle on a few good glugs of olive oil, and squeeze on some lemon juice. Toss everything together and taste - add more of any of the ingredients until the salad tastes good. Top with crumbled feta and serve. I've had this jam on my "to make" list for quite a while, and I was really happy with how it turned out. Unlike some other jams I've made this summer that have had depressingly small yields (so upsetting to spend time making jam and just get 2-4 jars, especially if the recipe lies to you about it! ), this one made eight jars full enough to seal plus one more almost-full jar for the fridge. The flavor is also lovely - all caramelized strawberry and spicy pepper. I didn't taste the balsamic as much as I was expecting to (especially once the jam is spread onto something), but I was still very pleased with the finished jam. 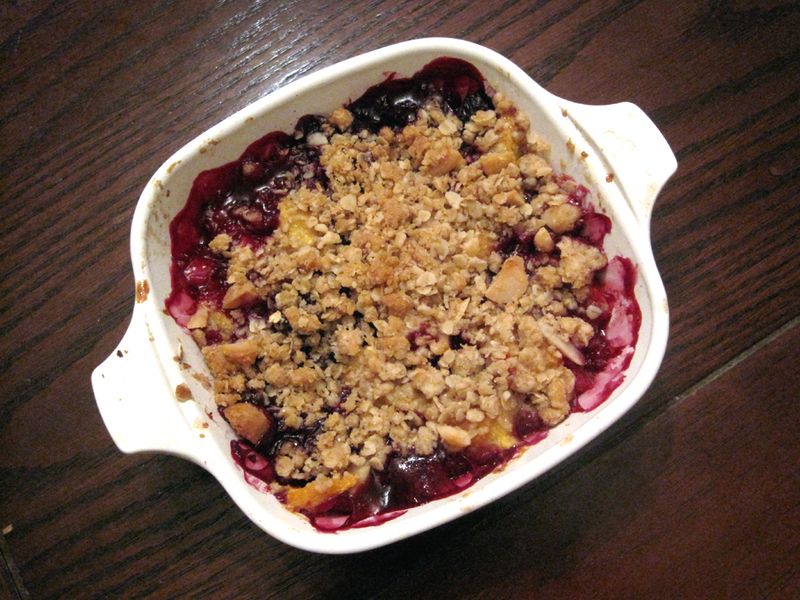 You can play around with the set you want, since this jam doesn't include any added pectin. After overcooking a jam earlier in the summer, I wanted a fairly soft set here. At room temperature, the jam is a little too liquid, which had me worried, but after a night in the fridge it had the perfect soft, spoonable set I was looking for. You can cook it to your liking by testing bits on chilled plates (I pop mini plates into the freezer before I start cooking) -- you can always cook it longer for a firmer set. One warning - use a big pot. I used my second-biggest large pot (which I usually use for making huge batches of soup), and it still almost boiled over. Once the berries break down, the jam will about double in size once it starts to boil. 1. 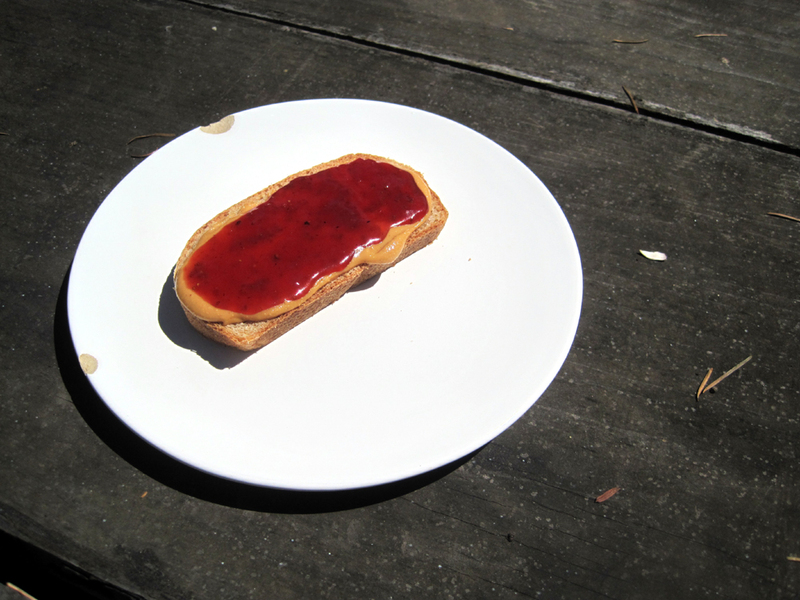 Place a saucer with metal spoons in the freezer for testing jam. 2. Measure out the lemon juice in a glass measuring cut, and add enough vinegar to bring it up to just over 6 ounces. 3. In a large pot, combine the berries with the sugar and half the lemon juice mixture. Place over medium-low heat and cook, stirring constantly with a rubber spatula. After a few minutes, when the juices start to run, gradually raise the heat to high, stirring often. Add several twists of black pepper to taste. 4. Boil vigorously for 20-30 minutes, gently scraping the pan every few minutes. If the jam sticks, decrease heat slightly but remain at a boil. After 15 minutes, taste the jam and add more pepper as needed. Continue to cook until the foam subsides and the jam is dark and shiny, about 25 minutes total. 5. Remove from heat and do not stir. After a moment, stir in the remaining lemon juice mixture. Return to medium heat and cook, stirring frequently, lowing the heat as necessary to prevent scorching. After 3-5 minutes, the jam should look glassy and dark. Remove from heat and test for doneness, and scrape off any foam while you test. You may need to cook the jam for a further 10 minutes or more, depending on the set you want. When jam is ready, skim off any remaining foam, stir well, and process in jars for 15 minutes. 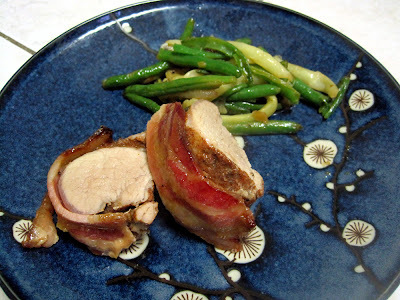 I made this pork loin recipe for Tim a week or so ago, and we really enjoyed the dish. The spice rub has just the right hit of spice, and the brown sugar glaze is sweet and delicious. Plus, you can never go wrong with wrapping pork in more pork! I did overcook it a bit since I couldn't find a meat thermometer - I definitely recommend using one to make sure you get your pork to the perfect temperature. Even so, the bacon and glaze ensured that the pork was still moist and tasty. The beans make a nice, quick side dish that adds a bit of green to the plate. The acid from the lemon juice is necessary to cut through the richness of the pork. Although I usually roast my beans in the oven, the recipe is a nice alternative if your oven is already full with another dish. 1. Preheat the oven to 350 degrees. Line a roasting pan or casserole dish with foil. 2. Whisk together the salt, chili powder, cinnamon, paprika, pepper, and cumin. Rub all over the pork, and then place the pork in the baking dish. Cover the pork with the bacon, laying the strips diagonally and cutting to size with kitchen scissors. 3. Roast for 35 minutes. 4. Meanwhile, make the glaze. Combine the brown sugar, flour, vinegar, and mustard in a saucepan. Simmer for one minute. Remove the pork from the oven and spoon the glaze over the pork. Roast until the pork registers 160 degrees on a meat thermometer, 10-15 minutes longer. Remove from the oven and let rest for a few minutes. Slice and serve. 1. Heat a large skillet over medium-high heat. Add the oil and heat 30 seconds. Add the beans and onion, and cook three minutes, stirring often. Add 1/3 cup water, cover, and steam for 5 minutes. 2. Remove the cover, add 1/4 tsp and cook over high heat, stirring often, until the beans are al dente and slightly charred. Stir in the remaining 1/4 tsp salt and pepper to taste. I'm sending this post off to These Chicks Cooked! I do love chewy chocolate chip cookies, but sometimes it's fun to go with something a little bit different. These cookies are basically a cross between meringues and chocolate chip cookies, so they're extra crunchy but also full of chocolate and nuts - yum! These are delicious on their own, but they're also really wonderful on the outside of an ice cream sandwich - they provide a great textural contrast to the soft ice cream inside. Another bonus is that these cookies have quite a bit less fat than your usual chocolate chip cookie - many recipes have as much as two sticks, while this recipe has less than one stick. 1. Whisk the flour, baking powder, and salt together. Set aside. 2. Beat the butter and sugars together. Beat in the egg and vanilla. Add the flour and mix to combine. 3. Stir in the chocolate, oats, and half the hazelnuts. Cover the bowl and place in the refrigerator for a few hours until the dough firms up. 4. Preheat the oven to 350 degrees, and grease baking sheets or cover them with foil or parchment. Chop the remaining hazelnuts until finely chopped. 5. Drop one teaspoon of dough per cookie onto the cookie sheet, placing the cookies 1-2 inches apart. 6. Flatten each cookie slightly with a wet fork. 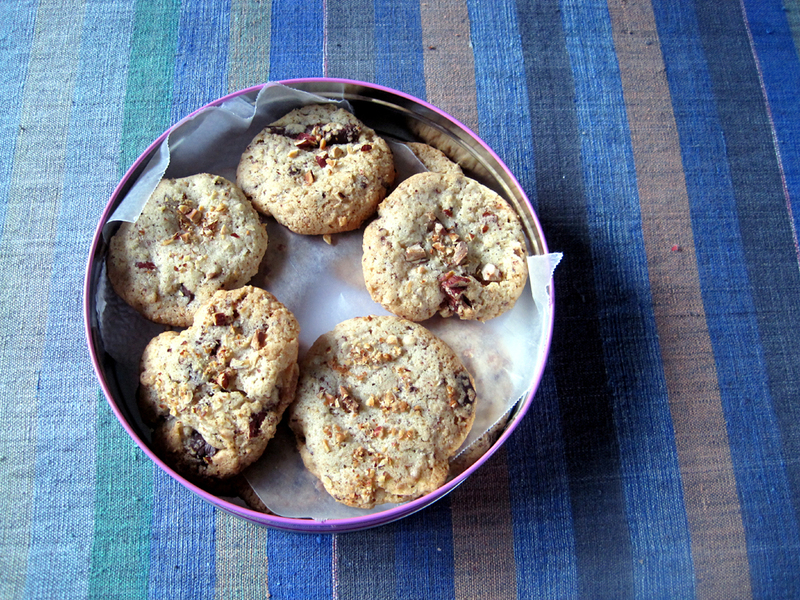 Sprinkle the remaining hazelnuts on top of the cookies and press lightly into the surface.
. Bake 10-12 minutes, until golden. Cool on a wire rack. Is there anything better than sour cherry pie? I would say no. 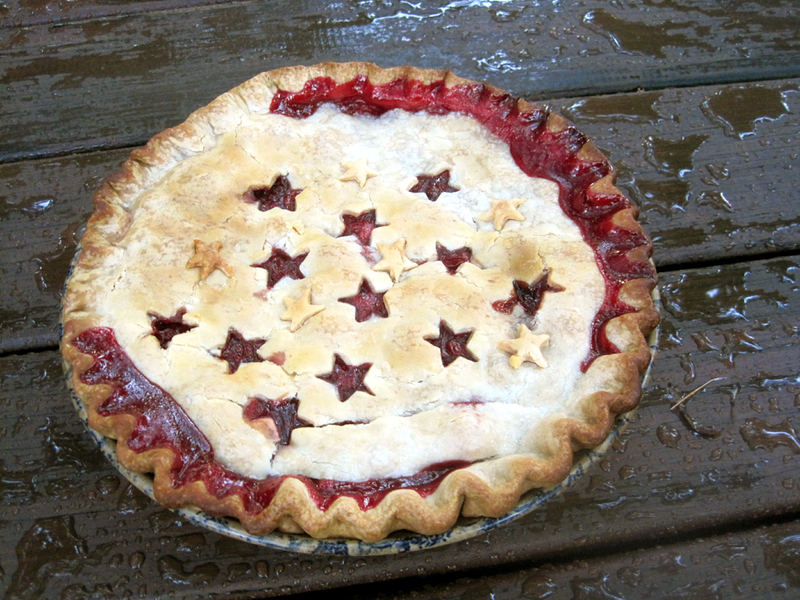 It's pretty much summer in a pie plate. This recipe from Martha Stewart is a classic - brimming full of delicious, juicy Michigan cherries wrapped in buttery crust. The filling has that perfect sweet-tart balance that always has me going for another slice. 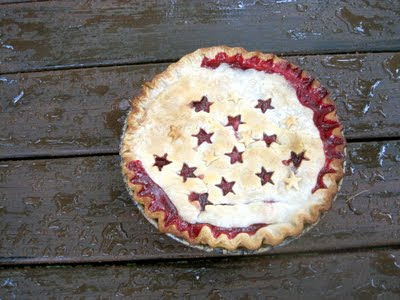 Plus, I love the star design my mom made for the top - so cute! If you can get a hold of sour cherries (might be too late for this year), you definitely need to make this pie immediately - you won't be sorry! 1. Roll out the pie crust into two circles large enough to fit into a 9-inch pie plate. Fit one circle into the pie plate. Cut small shapes out of the other circle with a cookie cutter and set aside. 2. Whisk together the sugar, cornstarch, salt, and cardamom in a large bowl. Add the cherries and vanilla and stir to combine. Pour into the pie plate. Dot the topping with butter. 3. Place the second crust on top of the cherries, and then fold under and crimp the edges. 4. 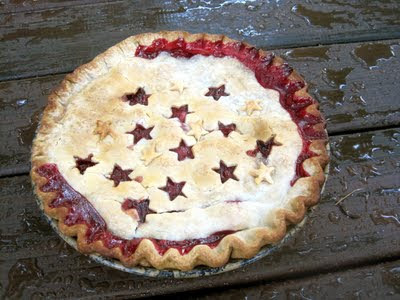 Place the pie in the refrigerator for about 30 minues. 5. Preheat the oven to 375 degrees. Bake the pie until the crust is brown and the juices are bubbling, about 1 hour. Cover the edges with foil to prevent burning if needed. 6. Cool the pie on a wire rack. I'm sending this pie off to These Chicks Cooked! 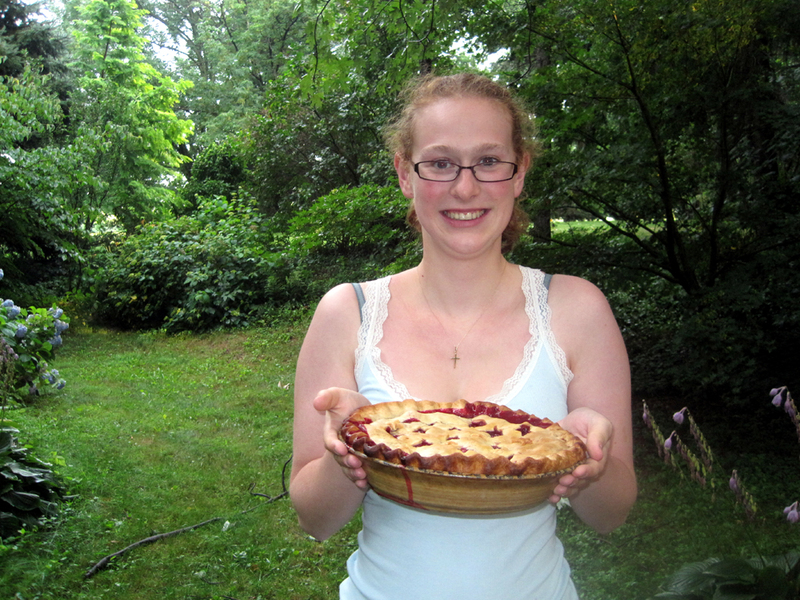 For this month's Secret Recipe Club assignment, I was paired up with Family, Friends, and Food. I was immediately drawn to her recipe for steak with blue cheese sauce, because I love good steak and I really love blue cheese. The sauce even sounded good enough that I convinced my mom to try it, despite the fact that she's a little skeptical of red meat! The blue cheese sauce seriously could not be easier (three ingredients shaken up in a jar), but it's absolutely delicious and pairs perfectly with steak. 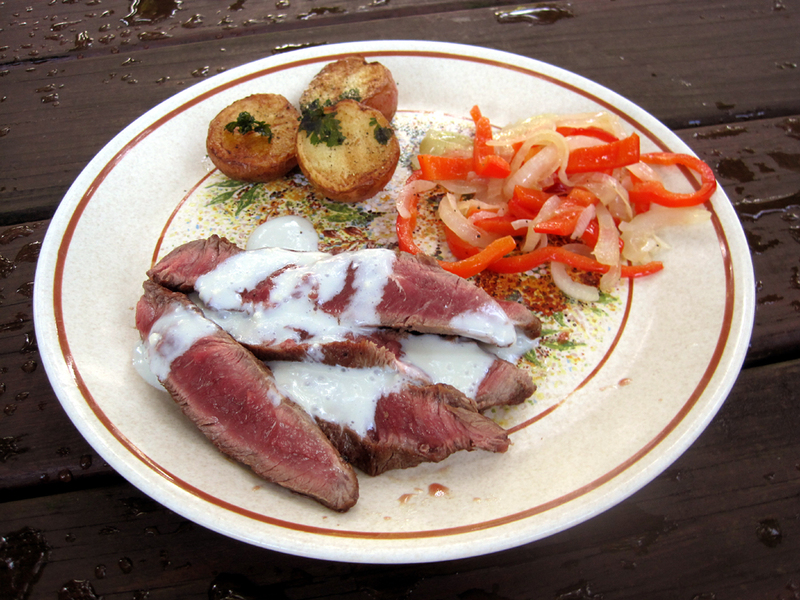 We served the steak with peppers and onions, as well as red potatoes sauteed in butter and olive oil. The sauce was also great with the potatoes, and I think it would be fantastic on a salad or a burger, too. Plus, I love having a recipe to use up little bits of leftover buttermilk - it seems I always have small amounts of things like buttermilk and cream in the fridge that aren't enough to bake with. This sauce is the perfect solution! 1. Put the blue cheese, buttermilk, and Worcestershire sauce in a jar. Tightly screw on the lid and shake until everything is combined. Taste, and add more Worcestershire sauce if needed. Set aside. 2. Season the steak all over with salt and pepper. Heat the oil in a large pan, and when the oil is hot, carefully add the steak. Cook to your desired level of doneness, and then remove to a cutting board and cover with foil. Let rest for about 5 minutes, and then thinly slice the steak against the grain. 3. Serve the steak with the blue cheese sauce. My dad and I made this delicious summer salad for my mom's birthday, and it was a big hit. 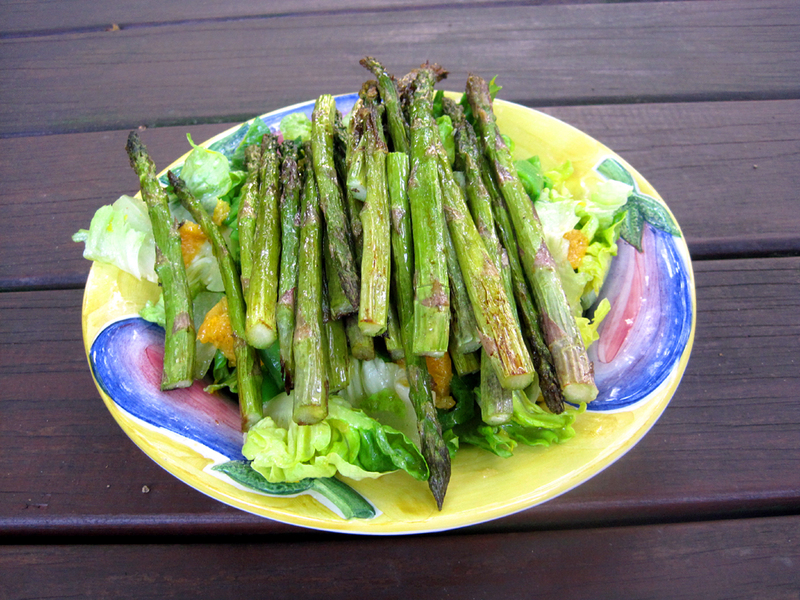 Something about roasted asparagus always gets me - it's definitely my favorite way to eat asparagus! Here, it's paired with juicy oranges, soft lettuce, and crunchy snow peas for a salad that's full of different flavors and textures. The Asian-inspired dressing pulls everything together beautifully. You can also substitute a different salad green - for instance, the original recipe calls for arugula - to change up the recipe. 1.Preheat the oven to 500 degrees. 2. Spread the asparagus on a foil lined baking sheet. Toss with olive oil and salt. Bake 8-10 minutes, until the tops begin to brown. Remove from the oven and let cool to room temperature. 3. In a small bowl, whisk together the ginger, zest, vinegar, lime juice, cayenne, salt, olive oil, and sesame oil. 4. Toss together the peas, orange slices, and lettuce. Gently toss in the dressing and transfer to a serving platter. Top with the roasted asparagus and serve right away. This chutney will make your house smell so good when you make it! Sour cherries make an excellent alternative to cranberries in this unique condiment. We had a 10-pound bucket of cherries to cook with, and so we decided to get a little creative and try something new. I'm so glad we did, since this chutney is really delicious; it would be great with pork or turkey, or even on a sandwich. We canned ours and we're planning to break out a couple of jars at Thanksgiving...I can't wait! This would make an excellent holiday gift since sour cherries are only available once a year. It's a great way to preserve their flavor to enjoy in the chillier months! I'm headed back to California this evening, and I'm glad to be taking a taste of Ohio back with me! Combine everything in a saucepan and bring to a boil. Reduce heat, cover, and simmer 30 minutes. Remove cover and continue to simmer until the mixture is thickened. Remove from heat and remove the cinnamon stick and cloves. Use immediately, store in the fridge, or process in sterilized jars in a boiling water bath to preserve. My dad found this recipe, and our family has fallen in love with it! Apparently my folks have made it numerous times, although I've only been lucky enough to help out with the baking and the eating once! The macadamia nuts in the topping add an interesting and delicious crunch since this is a nut you don't usually see in crumbles. As for the tasty fruit underneath, you can use pretty much any combination of fruit that you like, about seven cups total. The original recipe uses all blueberries, and my mom said that dried cranberries are also a delicious addition (about a cup or so). Just taste the fruit and add a bit more sugar if it's too tart. One nice thing about this recipe is that it fills an 8x12 pan generously, so if you'd like to sneak a little bit into a small baking dish for a tasting portion, no one will be the wiser! This was totally necessary in our case since my dad was taking the full-sized dessert to a work function, but the rest of us wanted to try some too! 1. Preheat the oven to 375 degrees and spray a 8x12 pan with oil. 2. Combine the fruit in a large bowl and add the sugar, cinnamon, cornstarch, lemon, and salt. Stir gently, pour into baking dish, and set aside. 3. Combine the oats, flour, brown sugar, and nuts in a bowl. Add the butter and mix until well combined and crumbly. 4. Sprinkle the topping mixture over the fruit and place the baking dish on a foil-lined baking sheet. Bake for about 35 minutes, until the fruit is bubbling. This is a very basic jam, but sometimes basic can be a great way to let fruit flavors really shine through. 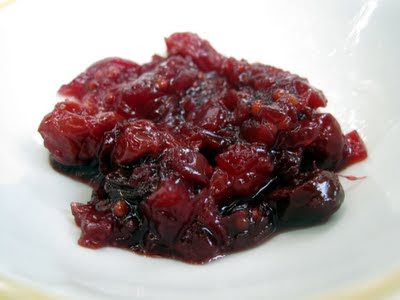 To make the jam, you simply combine pluots, sugar, and water, and then cook until you get the right consistency - which takes a while since the mix doesn't contain added pectin. 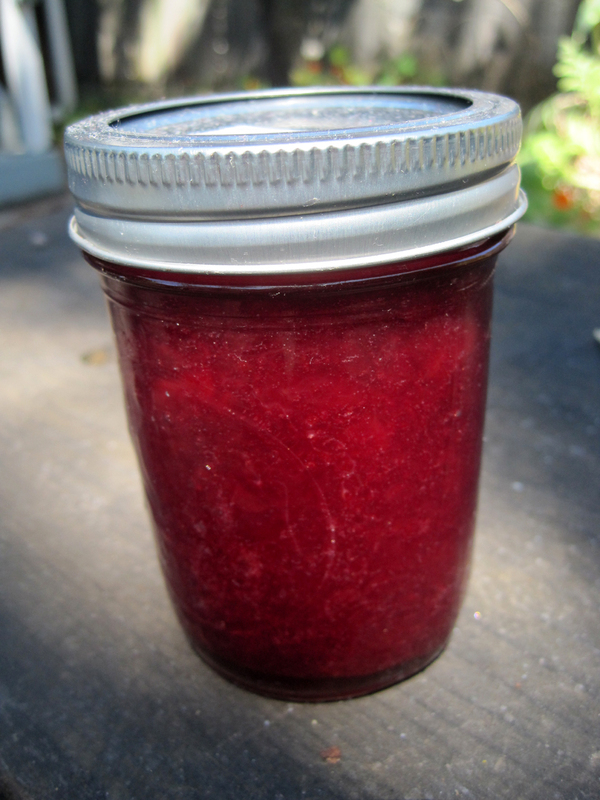 You might want to make this with a friend (thanks to my friend Sara for canning this jam with me! ), since otherwise you'll get pretty bored stirring the jam all by yourself with no one to talk to. The absence of pectin does have a reason, though, in that it allows you to use less sugar (many recipes with pectin contain equal parts sugar and fruit, and some even contain more fruit than sugar). This results in a tarter jam that's not super sweet, and a somewhat softer set than some pectin jams. Combine all ingredients in a large pot and bring to a boil. Boil, stirring constantly, until the jam passes the gel test. Warning - this will take quite a long time since there is no added pectin in the recipe! Fill clean jars, leaving 1/4-inch headspace. Process for 10 minutes in a boiling water bath, or store in the fridge or freezer.